We have agreed an exchange for and are now looking forward to AUTUMN/ WINTER . WE WOULD LOVE SOMEWHERE WARM BY THE SEA AND WITH A POOL. WE ARE OPEN TO SUGGESTIONS AND WOULD CONSIDER SOMEWHERE REALLY EXOTIC, SUCH AS NEW ZEALAND/ SOUTH AFRICA OR SOUTH AMERICA. Pitlessie House is a beautiful Georgian Manor House, built in 1737 with 0.5 acre of walled garden, only 15 minutes from St Andrews - the home of golf - in Scotland. 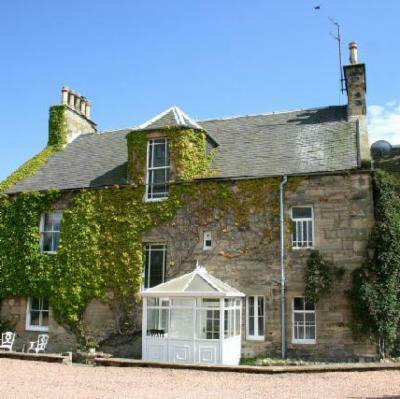 We would be delighted to welcome couples or families with up to 3 children or teenagers at Pitlessie House and can offer use of bicycles and our Mercedes if you feel confident of driving on the left side of the road. Pitlessie House is the perfect setting for a short break or longer stay on Scotland's sunny East coast. Whatever you want to explore -the country's best kept beaches, the home of golf in St Andrews, the delightful East Neuk fishing villages, Kelly Castle with its beautiful gardens and fine furniture collection, the historic village of Falkland with Falkland Palace, former shooting lodge of Mary Queen of Scots, it's all in the Kingdom of Fife within an hour's drive from Pitlessie House. Pitlessie House is situated 15 minutes from St Andrews and Cupar, 40 minutes from Edinburgh and Dundee airports and one and a half hours from Aberdeen or Glasgow airports. Trains to Aberdeen or Dyce, alight at Ladybank, 1 1/2 miles from Pitlessie House. Sorry, but non-smokers only please. No pets please. We sometimes operate Pitlessie House as a Bed&Breakfast, but will close down the business during exchange periods.